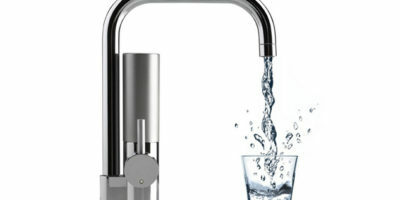 2.2 What Kind Of Kitchen Sink Should You Choose? Kitchens are no longer a place where you cook. They are a place where families get together, where you invite friends over for coffee, and where you read the morning news. This is why finding the right design for your kitchen is very important. Finding best kitchen sinks for your home is more than finding one with a finish that matches the other appliances. The sink is usually the centerpiece of the kitchen, and finding the right one will attract compliments and make people feel more comfortable when they visit. In the following article, we present top rated kitchen sinks, and we reveal their pros and cons. We explain which features you should look for when buying a kitchen sink, and which are not that good. At the end of the article, we explain how to install the kitchen sink by yourself, so you won’t have to hire a professional. It’s important to find the right sink because modern families nowadays spend more time in the kitchen than they do in the bedroom. It’s estimated that an average American spends five times more time in the kitchen than they do in the living room. This means that the kitchen doesn’t only have to be functional, it also needs to look good. The following guide will help you choose the right kitchen sink for your home. Whether your kitchen has a modern design, or a traditional one, we have the right sinks for you. 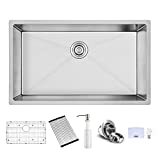 This is the highest rated kitchen sink available on Amazon in 2019, and after reading about it, you will understand why. The sink is made out of high-quality materials, it has a nice design, and it comes at an unbeatable price. This is one of the most quality stainless steel sinks this year. The sink would make a great addition to every household, whether your kitchen has a traditional design or a modern one. The whole construction is made out of 16G stainless steel, and it has a nice but functional design. You don’t have to worry about maintenance or scratches if you buy this model. The sink has rounded corners for easier cleaning, and the drain is set in the rear of the sink for a better water drainage. The sink’s surface is protected by a scratch-resistant patina that will only get better with time. You will be able to use the sink daily for years on end without scratching it. The deep basin will allow you to store more dishes and to wash larger kitchenware with ease. The underside of the sink is protected by thick 3mm double rubber pads. The rubber pads will act as sound dampeners, but they will also protect the cabinet from condensation and absorb the vibrations made by the waste disposal. This is one of the best selling kitchen sink models you’ll find on Amazon in 2019. It is a heavy-duty model that is ideal for new constructions and remodeling at the same time. 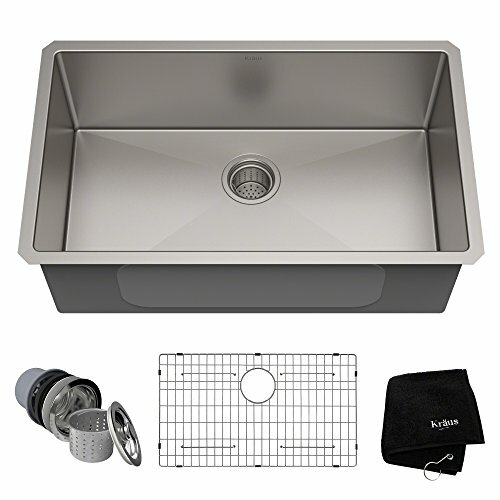 KRAUS KHU100-30 sink is made out of premium grade 16G thick stainless steel, which makes it one of the best stainless steel kitchen sinks. The stainless steel has a soundproofing and protective undercoating, so you don’t have to worry about the noise when you use it. Unlike other metal sinks, this model won’t produce a loud sound when you drop something in it. The main advantage of using a stainless steel sink is the increased durability. The thick steel used for this model also protects it from denting, so it’s more likely to last longer than other models. Another advantage of this sink is its capacity. The basin is extra deep, so it will be able to accommodate even the largest kitchenware you own. This makes the sink a great choice for busy kitchens because you will always have enough space to store and clean many dishes and pots at the same time. This sink is engineered for optimal drainage and it has channel grooves that will prevent the water from pooling on the bottom of the sink. The easy-to-clean satin finish requires minimal maintenance, so the sink will not feature hard water stains at all times. This is our budget choice for this category. While this kitchen sink might not be as large or as flashy as other models, it will definitely get the job done for the regular household user. The sink is made out of 22G stainless steel and it comes with a sound reducing shield, ensuring a quiet use and functionality. The sink as a double bowl, so it will be easy to use when you have a lot of dishes and pots to clean. However, you have to keep in mind this sink is only 6.5” deep, so you will need to angle larger pots when you clean them. Moen sink is made out of thick stainless steel, and it should last for decades if you install it right. Some customers complained that the sink is hard to install, but this is far from the truth. The only downside of this unit is that it doesn’t come with the clips you need to tighten it down to a counter. However, this is a small oversight by the manufacturer, and you shouldn’t spend more than a few dollars at your local hardware store to overcome it. Both bowls of the sink have two coatings of rubber acting as a sound shield. This will increase the sink’s functionality. This is a handmade sink that will make a great addition to every household. The sink has a single bowl and will prove a good match for both modern and traditional kitchens. 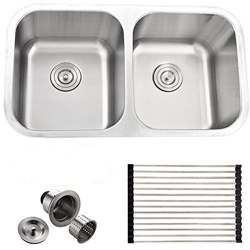 Harrahs sink is made out of 11G heavy duty stainless steel, and it benefits from a good sound dampening technology. The non-toxic protective coating good for more than reducing sounds. It will also condensation from forming under the sink, increasing its durability. The thick steel used for the sink’s construction will guard against damage from usual wear and tear, and it will also withstand harsher treatment and accidents. Another good feature of this sink is the satin finish. The finish is both stain and scratch resistant, and it will maintain its sheen for a long time. This finish will require minimal maintenance, and the kitchen will look clean for a long time. The basin is deep and spacious, and it will contain splashing with ease. 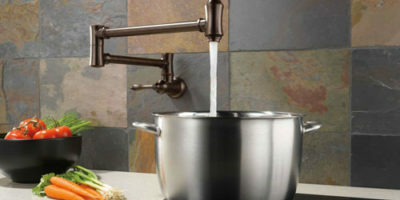 One of the benefits of having a deep sink is that you can manipulate large kitchenware with ease. 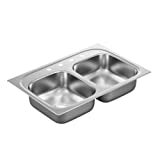 You will be able to wash stockpots and larger trays in this sink without any problem. The drain is set on the rear of the sink, so you will be able to use a larger area of the sink. This is one of the best-looking kitchen sinks available in 2019. The sink is made out of 80% natural granite, and it actually feels and looks like real stone. The sink will look great in every kitchen, and it’s the kind of product that will bring you a lot of compliments. The clean lines of the sink and its detailed design will highlight the elegance of the granite, and the sink will quickly become the centerpiece of your kitchen. The deep basins will accommodate large dishes and pots, and you will be able to manipulate them with ease. You don’t have to worry about scratching and cracking this sink. Both bowls are protected by a thermal finish. The finish creates a surface that is resistant to scratches, heat, chemicals, discoloration, and chipping. The sink as a deep black color with a few silver sparkles in it. The color is very well chosen because it will mask the hard water stains that might appear on its surface. The sink is easy to install. You can choose a simple top mount installation, or you can install the sinks as an under mount for a flawless look. The package contains all the hardware you will need for the installation process for both mounting options. The sink has rounded corners for easier maintenance, and the matte finish keeps a clean look for a long time. This is a good double bowl kitchen sink that will make a good fit for most households. The sink has a stainless steel construction and a rounded corner design for an easier maintenance. The sink is made out of durable 18G stainless steel and has a strong robust appearance. The commercial grade stain resistant satin finish will have a soft ageless glow for years to come, without having to worry about scratches or chips. One of the best features of this kitchen sink is the sound dampening technology used. Both bowls benefit from a thick rubber insulation which acts both as sound dampening pads and an undercoating. The undercoating will prevent mold and rust to form under the sink, increasing its durability. The larger basin is 9” deep, while the smaller one is only 7” deep. The deeper bowl will be able to accommodate your larger kitchenware, while the other one can be used for the more common everyday tasks. Comllen sink is easy to install, but it requires an under mount installation. If you want a single hole installation, the sink comes with all the hardware you need. 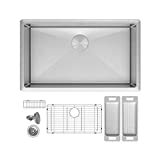 Even though the sink comes with all the hardware required for the installation, you will need to buy cover plates for the unused holes. There are several things you need to consider before you buy a new sink for your kitchen. Whether you are redecorating, or you’re building a new home, try to think of the kitchen like the centerpiece of your home. This is where you will most likely spend more time with your family, so a modern sink has more purposes than just functionality. In the following section, we explain what to look for in a good kitchen sink, and how to find the right model for your home. Did you ever notice when shopping online for a sink, or when you’re looking for one in a local store that there are different types of sinks? Did you ever wonder why? Here are the main types of kitchen sinks, and the different advantages using them will bring. Single Basin Sink – This is currently the most popular type of sink worldwide, even though you will more likely find it in homes than in restaurants or bars. The main reason for this types of popularity is its functionality. A single basin sink gets the job done, and it doesn’t take up much space. However, there are several subtypes of single basin sinks, each with its own advantage. Small Basin – This is the most common single basin sink model. It’s small and usually made out of stainless steel, but you can still find models made out of brass, copper, or other materials. The advantage of a small basin sink is that it doesn’t take up much space, so you will be able to use it in a small or crowded kitchen. One of the disadvantages is that washing larger pots and depositing many dishes in it can be tricky. Tricky, but not impossible. 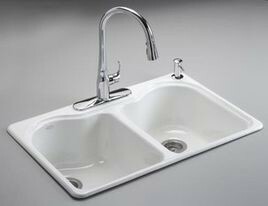 A small basin sink is usually easy to clean and maintain, and it also has the advantages of being durable and cheap. Large Basin – This type of single basin sink is growing in popularity in recent years. When homeowners redecorate their kitchens, they usually include a large basin sink if they choose a single basin model. One of the advantages of using this type of sink is the large surface it offers. You can store multiple dishes in it, and you can manipulate larger pots and trays with ease. Another advantage is the drain. These sinks are usually designed with a slight incline so the water won’t pool on the bottom. This increases the water drainage and makes the sink more efficient. 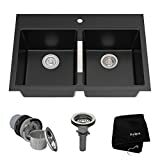 These sinks are usually better looking than the other single basin models, they’re usually made out of stainless steel, and they come with different finishes. Round Basin – This type of sink became popular after being introduced in an IKEA catalog. However, not a lot of manufacturers choose to produce round single basin sinks, and here’s why. First of all, you need a custom counter to install the sink. Since most counters come with a pre-designed rectangular space for the sink, most people won’t even consider buying a round model, so the manufacturer will make less money. Second, they are not very large. A rectangular sink will offer more space than a round one. Washing larger pots and dishes in a round sink can lead to a lot of spillages. The best thing about round sinks is that they look great. If you have a custom designed kitchen, a round basin sink might be just the thing you’re looking for, even if it’s not as efficient as other models. 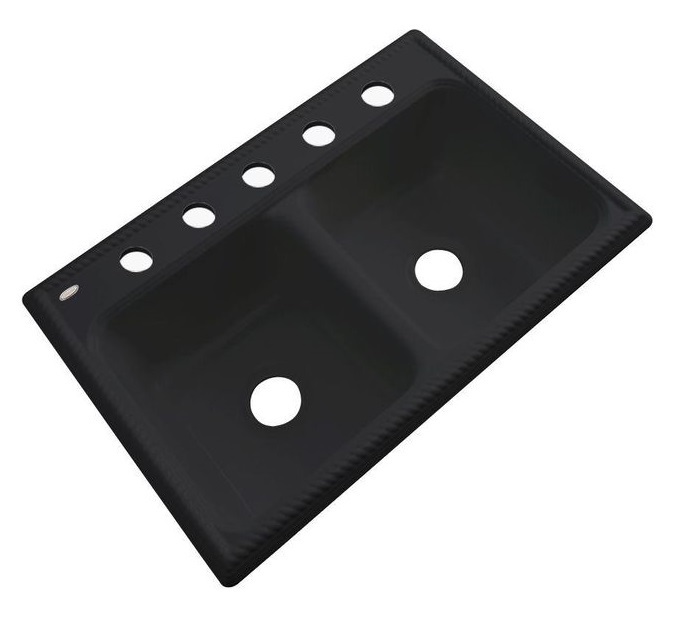 This is a very popular sink design for restaurants, bars, and pub owners. The double sinks offer you the possibility of depositing dirty dishes in a basin and using the other one to clean them up. This is also a very popular model for larger households who use more dishes. There are more types of double bowl sinks, each with its own advantages. Even Bowls – These sinks have equal bowls, so there are no real advantages of using one or another. The main advantage of this type of sinks is that they offer a larger surface. You can use this extra surface to deposit more dishes, or you can use it to clean larger kitchenware easier. Another advantage is that these sinks look great. Uneven Bowls – These sinks have uneven bowls. One of them is both larger and deeper than the other. You can use the smaller, shallower bowl for day-to-day needs, and you can use the other one when you have to clean larger dishes. The advantage of this system over the one with even bowls is that is easier to maintain. Sinks that have two large basins are harder to clean, and you need a pull-down faucet to use them at their best. The sinks with uneven bowls can be used with good results with a normal faucet, as well. Also known as apron sinks, these models are similar to the double basin ones or with the large single basin ones, but they’re deeper. At first glance, most people won’t be able to tell the difference between the two types, but it becomes obvious when you have to clean a large pot. While the top of the pot usually reaches the top of normal sink basins, it will not reach the top of farmhouse sinks. Short people usually benefit most from farmhouse sinks because they don’t have to lift the pots above the tip of the sink to clean them. What Kind Of Kitchen Sink Should You Choose? Now that we’ve seen which are the different type of kitchen sinks, let’s find the right one for you. Here are some things you should consider before buying a sink for your kitchen. This is an important thing to consider, even if you own and use a dishwasher. If more people usually eat at your house, chances are part of the dishes will still be washed by hand. Even if you use a dishwasher, you will still need to clean the rest of the food from the dishes before you put them into the machine. This means you will need a large sink. The best kinds of sinks for this situation are a large single basin sink, a farmhouse sink, and a double basin sink. If you usually only clean up after a few people, buying a very large sink might not be necessary, unless you can integrate it well into your kitchen’s design. You could just buy a small or a round single basin sink and solve the problem. However, you should know that the best models on the market in 2019 are usually large or double. Washing dishes is not the same thing as washing pots, pans, or bowls. And heating up a microwave dish is not considered cooking. Not in the real world, anyway. If you cook often, you should buy a sink that will allow you to clean all your kitchenware with ease. The best type you can buy for this purpose is the farmhouse sink. These sinks are large and deep, and you will have enough space to clean most objects in your kitchen without any spillage or other problems. You can also use a double basin sink for this purpose with great results. On the other hand, you don’t need to buy an extremely large kitchen sink if you usually eat out or order in. Unless the sink’s design blends right in with the rest of your kitchen decor, there’s no need for it. 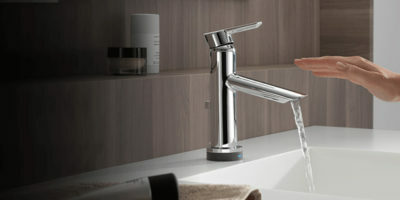 Do You Like Using Pull-Down Faucets? Pull-down faucets are used by more and more homeowners. They act as a regular faucet, but you can also pull down the spray head and extend it for an increased mobility. However, there are some people who don’t like using pull-down faucets. Whether it is because they consider them ugly, or because they consider them more prone to breaks, they don’t want to use them. If for one reason or another, you’re one of these people, you should choose a single small basin sink, a round sink, or a double basin sink. Keep in mind that the double sink will be harder to clean if you don’t use a pull-down faucet. What Installation Type Do You Prefer? Topmount Sinks – These sinks are mounted on top of the kitchen counter. This means they will be more visible. They will stand out against the countertop, and sometimes that’s just the point. Some people consider top mount sinks too bulky, but they look great if the kitchen’s design allows it. Undermount Sinks – This type of sinks are installed underneath the kitchen counter. This makes them more efficient because you can wipe debris directly in them, but they’re less visible. Besides being more practical, these sinks are also better suited for shorter people or children because the added height of the counter and the top mount sinks can be uncomfortable. The downside of these sinks is that they are less visible, so people might spend time in your kitchen without even noticing them. What’s More Important? Design Or Practicality? Both? Kitchen sinks come in different forms and patterns, but not all of them are very practical. Some of them might look spectacular but won’t perform well in the long run, while others might not seem like much at a first glance, but will perform exceptionally for years to come. 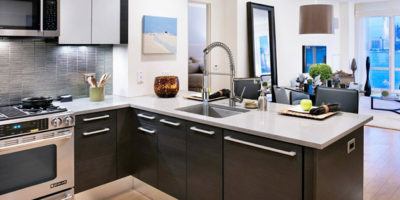 Design First – If you don’t really use the kitchen sink other than to wash some dishes now and again, but you or an architect designed the kitchen to look amazing, you might want to go for a great looking model. Even if the sink will not be very comfortable to use, and you will have some problems washing large pots or dishes, it will be worth the investment. 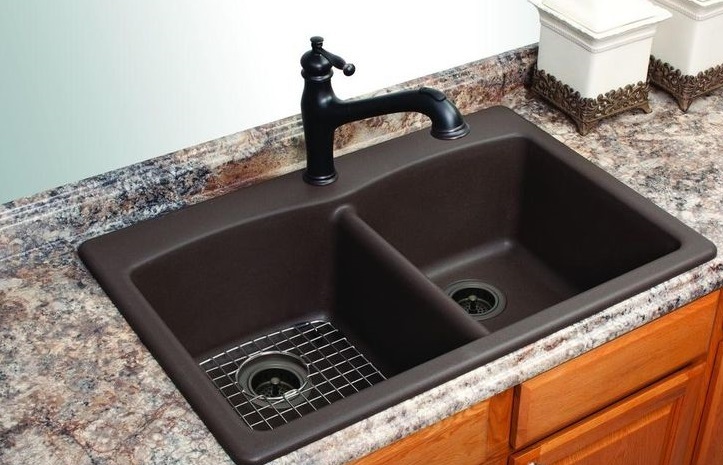 There are many sink models that could fit in this category, and most of them are top mount sinks. The main advantage of top mount sinks is their great looks, but they can be uncomfortable to use because you have to keep your elbows above them when you wash dishes and this can be tiresome. If you want to choose a spectacular looking sink, you should go for one made out of an unconventional material. You should avoid stainless steel models unless the rest of your fixtures are also made out of stainless steel. Some of the best looking models are made out of copper. A copper sink will add a touch of class and elegance to your kitchen, and if you place it somewhere the sun can touch it, it will light up the room. Another great choice would be a granite sink. These sinks are elegant and they’re also extremely sturdy, so they will last a very long time. 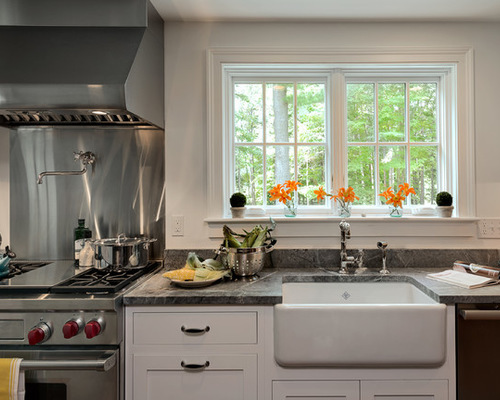 A granite sink will make a great addition to both traditional and modern kitchens. You can install one if your kitchen incorporates more stone-based elements. This kind of sink is not easily overlooked, and it will bring you a lot of compliments. It’s also a great conversation starter. Functionality First – If you want to have a highly functional sink, but you don’t care if anyone notices it or not, you should buy an under mount model. The best under mount kitchen sink is easy to use, and it can even be used comfortably by short people and children. If you are going for functionality, you should choose a double bowl sink made out of stainless steel. The double basins will allow you to store more dishes and wash larger pots at the same time. If you choose a sink with uneven basins, you can use the smaller one for daily activities, and use the second one only when you have a higher workload or larger objects to clean. Design And Functionality – Finding a kitchen sink that’s both aesthetically pleasing and very functional can be difficult these days, but we’re confident you’ll be able to find some models in our kitchen sinks reviews. Farmhouse sinks might be a great choice for people who want special designs and are very functional. They are deeper than other sink models, and that makes their appearance unique. This depth also helps with cleaning dishes. Double basin sinks made out of granite would also be a great choice. They combine a highly functional design with a great material, and the combination will look good and perform well at the same time. When it comes to kitchen sinks, there is no such thing as the best material. The best kitchen sink brands use a lot of materials for making sinks, and all of them have advantages and disadvantages. different gauges. A higher gauge means the steel is thinner. 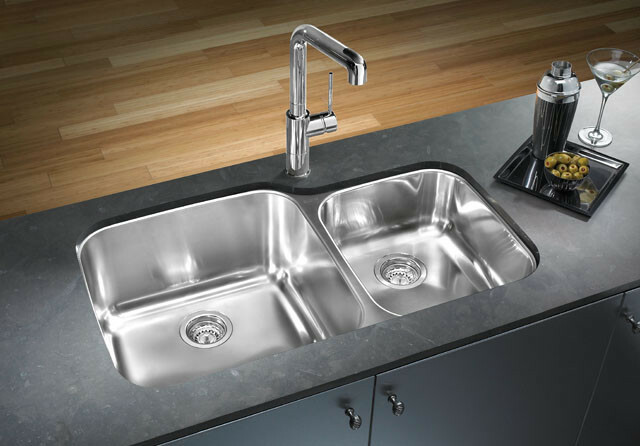 Unlike other materials, stainless steel is actually lightweight, so even the thickest steel sink will still be lighter than a granite or cast iron model. Stainless steel offers multiple advantages. It is durable, lightweight, and easy to clean and maintain. It also comes in a lot of different finishes, so you’re bound to find one that matches your other fixtures and appliances. A downside of using stainless steel is that it can be a little noisy. Manufacturers try to cancel some of the sounds by using a special coating or rubber pads. These features considerably lower the noise produced by the sink use. sinks continuously for decades and they’re still both functional and good looking. Cast Iron sinks resist heats of up to 1000 degrees F, they come in many color variations, and they have sound deadening properties. The best thing about them is their long-term durability. Copper is a natural antimicrobial element. It is also a durable material which is impervious to rust and tarnishes. 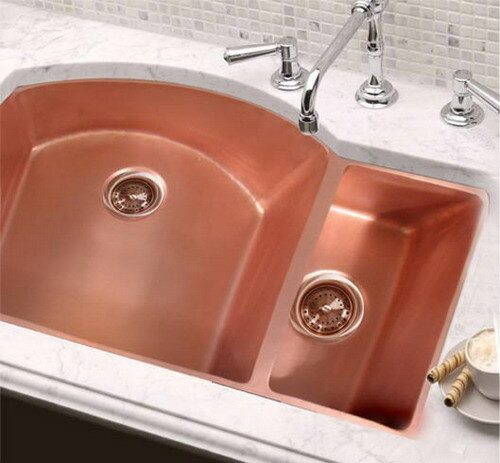 Copper sinks usually come without a coating of finish, and over time a patina will form. The patina’s pattern will create a special unique look for every individual sink, so there won’t be any other sinks that will look exactly like yours. Composite – Composite sinks are usually made out of a combination of acrylic or polyester resins with granite or quartz particles. This combination is dried to create a hard surface. These composite materials are stain and scratch resistant, and they’re impervious to chips. They come in multiple colors, but you’ll most likely find them in white. They have sound-deadening proprieties, they’re lightweight and easy to install. 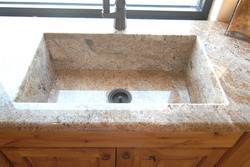 Granite sinks are usually made out of a combination of granite and acrylic. The granite can add up to 80% or more of the combination. The resulting material is stain and scratch proof and resists temperatures of up to 537 degrees F. Granite sinks are some of the most beautiful models, and they come in a large variety of colors. These sinks usually have a steel or cast iron frame which is coated in a porcelain enamel. This makes them impervious to stains and scratches. The porcelain coating can withstand temperatures of up to 1000 degrees F, and they usually have sound-deadening features. 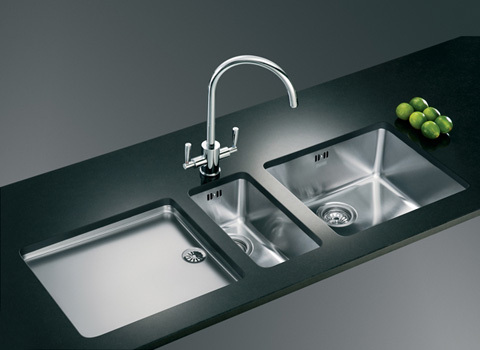 sinks are made by pouring the material into predefined shapes. The material is then reinforced with either a fiberglass or a composite back for increased durability, support, and sound dampening features. They are usually lightweight, they come in different colors, and are easy to clean and maintain. The acrylic surface can be polished if it gets scratched. Now that you bought a nice kitchen sink, you need to install it. While some people will need professional assistance, people who are used to doing different chores and tasks around the home will be able to install the sink by themselves. In the following section, we explain how to install an under mount kitchen sink in 3 easy steps. Make Sure It Fits: The first thing you have to make sure if is that the sink will fit the countertop. If you plan on installing an under mount sink, you might have to modify your countertop to make it work. Some sink manufacturers will include a cutting template in their package. This template will help you cut a hole in the countertop. If your sink’s manufacturer didn’t supply a template, you’re going to measure the surface you need to cut by yourself. Remember that the rule of thumb is measure twice or three times if you have to before cutting once. You should install the faucet and waste lines before you mount the sink because it will be easier. Cut The Hole: Place the sink upside down on the countertop, and make sure you measure it from all sides to center it properly. Use a pencil to draw a guideline around the sink. Tip – You can use your mobile phone to take a picture of the sink’s outline to make sure it’s centered. Now measure the depth of the sink’s lip, and mark this depth all the way around the first outline. Use a drill with an auger bit (or a flat bit) to make holes in each corner of the sink, inside the smaller outline. Make sure the drill is placed right before you start making the holes. After drilling the four holes, take a jigsaw and cut the inside line starting from the newly drilled holes. Make sure you support the countertop from underneath while you cut. If you don’t support the countertop, its weight might bring it down and break it before you start cutting. After cutting the new hole, make sure the sink fit well. Use sandpaper to smooth out the corners if the fit’s too tight. If the sink fits, use a preservative primer to seal the cut edges. 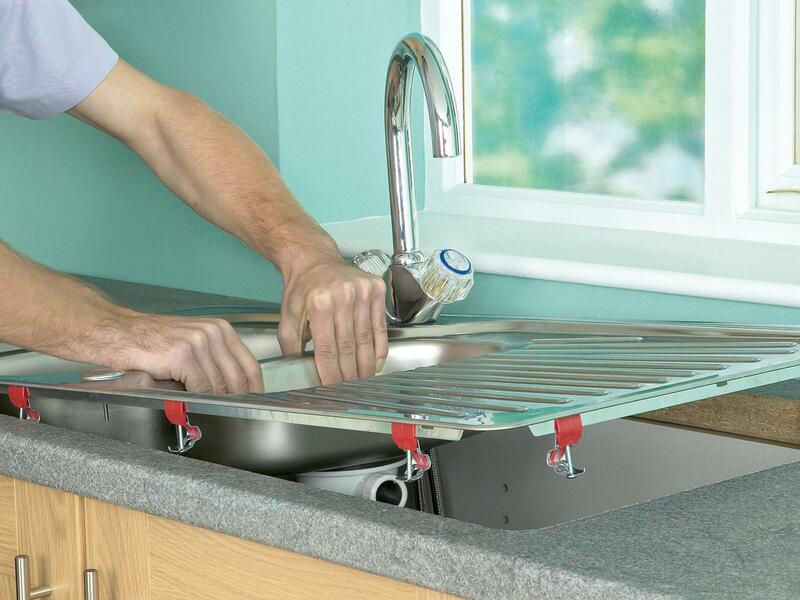 Mount The Sink: Now that the hole in the counter will definitely fit your sink, secure the sink using the nuts and washers supplied by the manufacturer. Install the faucet hoses. If you have a waste assembly, now is the time to install it and connect the overflow. You should do this according to the instructions supplied by the manufacturer. Don’t forget to use the seal or gasket provided by the sink’s manufacturer. If there were no seal or gasket in the box the sink came in, use caulk to waterproof the hole in the countertop. Install the retaining clips around the sink and tighten them to the countertop from the underside. If you used caulk, some of it might have squeezed out during this process, so make sure you wipe it away. Connect the faucet to the main water line. Your job is now done. Note: The installation process might differ from one sink model to another. However, this process should apply to most under top sink models. Kitchens are more than just a room in which you cook. They are a place where families get together. As the kitchen becomes a centerpiece of the house, the kitchen faucet, the water filter, and the kitchen sink become important features too. We’re confident that after reading our article, you are able to find the best kitchen sink for your home. 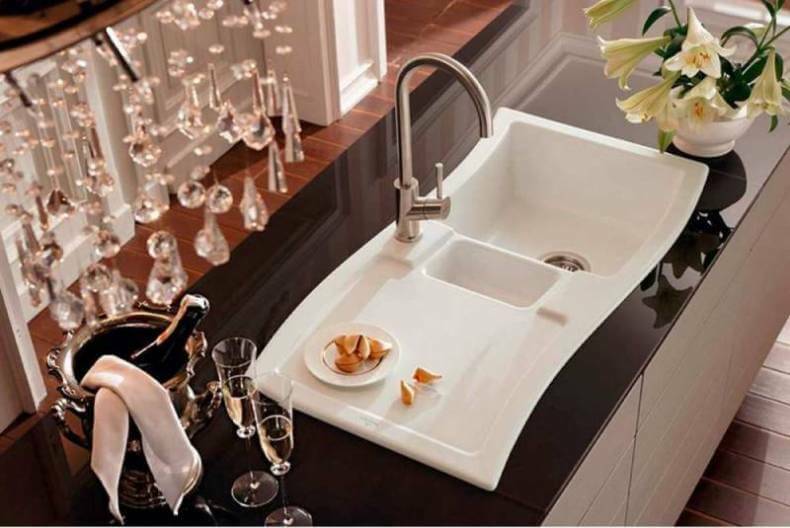 Keep in mind that you don’t have to rely on design alone, a good sink also has to be functional. If you have children in your household, buying a smaller sink they can use can be a real advantage.